You might recall me starting a knitted scarf at the end of May, from the Hitchhiker pattern; you can read the post here). Over the course of June, alongside crocheting the ripple blanket, I happily knitted away on the Hitchhiker. The pattern is very simple, perfect for me as it requires little or no concentration. 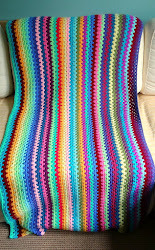 At the end of the month, just after I completed the ripple, my Hitchhiker was also finished. No sooner was it off the needles, I was wearing it almost constantly. I am something of a scarf junkie, never really feeling comfortable without something to keep my neck warm. A kind of adult comfort blanket, if you will. I was waiting for a nice day to take some pictures of my beloved creation, but unfortunately, that day never came because the weather was so awful. It was however perfect weather for a wool scarf and I wore it daily. Alas, one Friday night I wore it on a night out and consumed one too many Babychams. I became warm, put the scarf on my chair and then when I staggered walked home later, it got forgotten. When I realised that it was missing in the morning I made lots of strangled 'Noooooo' noises ( and a few swear words may have escaped my mouth) and did some frantic scurrying around trying to find it. Two return visits to the local hostelery in question failed to yield my precious possession and even the power of Twitter was unable to help me; I have declared my scarf lost. Last night when telling the girls about SnB about it, I recounted the tale of when my car was stolen with my son's buggy inside it which had a rather funky liner that I looked for everwhere for ages afterwards. While telling the story I realised that losing the scarf was actually more annoying than losing my car, what does that say about me?! My car was found, and although it looked like this, at least I knew what had happened to it, and got some compensation (three teenagers took it and were chased by the police before crashing, unfortunately they were un-injured and eventually not prosecuted either, grrr). Sadly, I may never know what happened to my Hitchhiker. I can only hope that some lucky (or un-scrupulous) person is enjoying wearing it as much as I did, and it is not currently residing at the local tip. Anyways, I have done my mourning, and yesterday I began Hitchhiker #2. This time I am using Arucania Ranco, which is not quite as nice as the hand-dyed yarn I bought from Bex and used last time, but is a passable substitute. To avoid the horrors of the four hour skein to ball nightmare I had last time, I enlisted some help to transform this one (thank you Teresa!). I also happened to have a perfectly co-ordinating project bag which was unsold from Larmer Tree to keep all my bits in. This time, I will try not to eat Malteasers and watch tv while knitting, to avoid the mistakes I made last time. I have also devised a better way of keeping track of the row I am on, in the form of a little flip-chart (the green card you can see in the picture).It did annoy me that tooth 10 wasn't pointed on my original version, and the first 20 teeth are the most visible the way I wore it so this new scarf will hopefully be a vision of perfection. Whilst browsing in Michelle's shop (Carly's Crafts) yesterday, I also found a reasonably priced sock yarn which I will use to attempt my first lace pattern, also a shawl. I just have to wait for some more needles and need to make some stitch markers. If you are a member of Ravelry, you should be able to find the pattern here. If not, if you enjoy knitting or crochet you should join. It's free and is a fantastic resource for patterns (lots free), advice and inspiration. Today is the last day of school for my children and I am really looking forward to a good long break with them. We have got a few things lined up to keep us busy, but mostly we will just be enjoying the change of routine and the chance to have some little adventures.